First drafts are very fluid for me--they shift and merge a little at a time as I work through the story. A strong synopsis gives me an excellent road map to use, but all stories shift and merge and change as they go along, primarily due to the growth of the characters. During the course of a first draft, I find or create various images to help me visualize and describe the characters and their environment; I write scenes that help me define characters and their motives but never make it into the novel. I draw maps, or locate pictures or scenes of different landscapes, and sometimes I find pictures of men or women who make me think of my characters. I keep them on hand for inspiration. Sometimes, I post them to my Tumblr, other times I just save them to my hard drive and pull them up when I need to strengthen my inner vision. About a week ago, I changed my cover pic on Facebook (and a couple of other places) just for something new. Back during the winter, Robert Dunbar posted a spooky little pic on his Pinterest page that intrigued me. I took the pic and edited it heavily in my photoshop program in order to make it look like a character from my new work in progress, Cygnet Moon. Several people asked about the picture and a few people speculated that the character was supposed to be evil, but he's not. I'm reposting him here with the excerpt so you can meet Makar's ar'nel with the understanding that all of this might change before the first draft is finished. 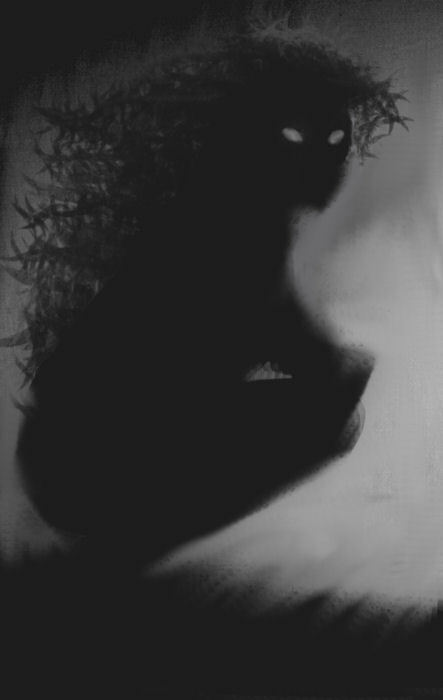 He is a black shadow with wild hair and eyes like nickel. My ar’nel is my magic made manifest, the breath of my spirit. My grandmother’s ar’nel exhibits itself as a great gray swan that follows her like a shade. When she visited me, her ar’nel filled my chambers and enveloped her in a pearl mist. The tapestries undulated like waves and the shields that decorate the walls trembled in her passing. My ar’nel barely causes the lamp flames to flutter. I glare at him. If he was a great spirit like grandmother’s swan, I could use him to force the guards aside; they would have no choice but to obey my commands. Instead, I am left with this wicked magic that refuses to obey me. He is good for tipping over inkpots and knocking paintings askew but little else. I've got two short stories to finish, then I am back into Makar's world in Cygnet Moon. If you want to leave a comment, let me know what you do to build your worlds during your first drafts. I'm involved in the final edits of THE GARDEN. Due to the need for a new chapter towards the end of the novel, the dynamics in two subsequent chapters have changed somewhat, so I'm working on the rewrites of those scenes. Another part of wrapping up my final edits includes reading the text out loud for clunky sentences and poor grammar. It's time consuming, but the process helps me catch missing words and/or clumsy phrasing. I'm also finalizing some research on honorifics for Hebrew kings. Yair Goldberg has been invaluable in sending me information, so I should have those details hammered out soon. Speaking of research, I'm working a blog post about the need for research in a novel. I'll keep you posted about that. I'll be talking about Urban Fantasy and Gothic fiction on the newest Mind Meld. Watch SF Signal for updates. To all my dear friends in New York City and in the northeast: My heart goes out to you in this terrible crisis. Please keep yourselves safe and know that we are thinking of you--and sending whatever aid we can. I have a guest post up today over at the book blog Fantasy Cafe. Kristen has made the entire month of April Women in SF&F month and today is my turn. I talk about honoring your demons and why dark sides are important. Check out Women in SF&F Month at Fantasy Cafe. Several people have asked on different occasions about the research materials that I used for Miserere. If you're interested, you can find these resources under the Research tab at the top of the page. I left journal articles off the list, because they can be difficult to locate; however, most, if not all, of these books are still in print. Just click Research if you want to see the list.